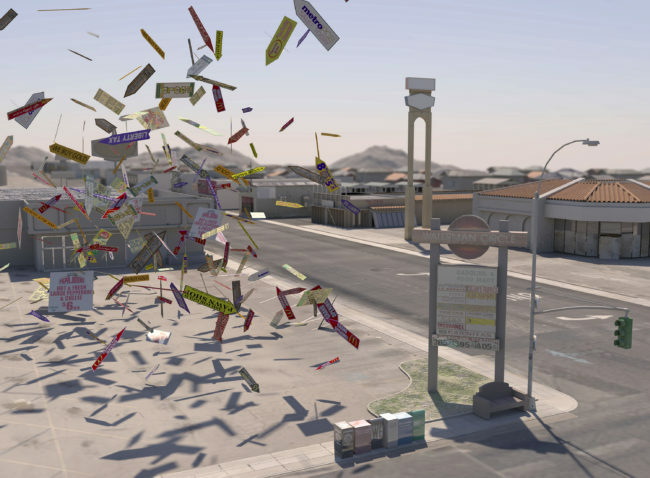 Encapsulated in an artificial universe, brought to us through flickering screens and printed surfaces, Tim Portlock’s, Ash and Gold, at Locks gallery, displays what is dismally all too familiar: the contrast of post-industrial decay and the mocking chrome luster of advertisements. 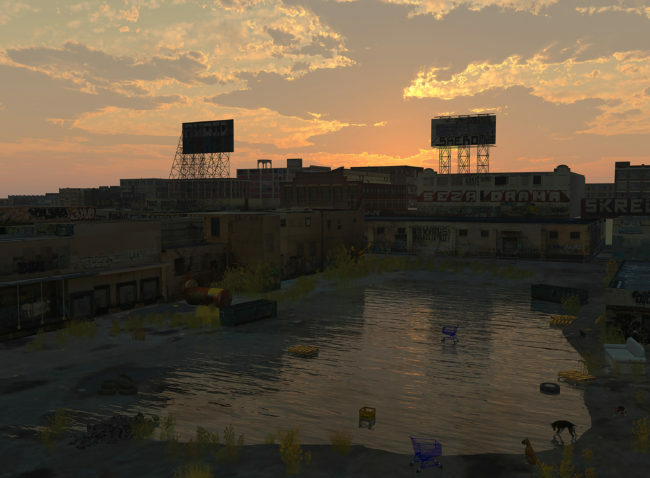 Utilizing game engine software, photography, digital effects, and three-dimensional animation, Portlock shows us vistas of a post-human wasteland, spoiled with the leftovers of globalization and technological change. We look back through new media, which has unrivaled potential to realistically envisage new worlds, to a future beyond redemption and hope. 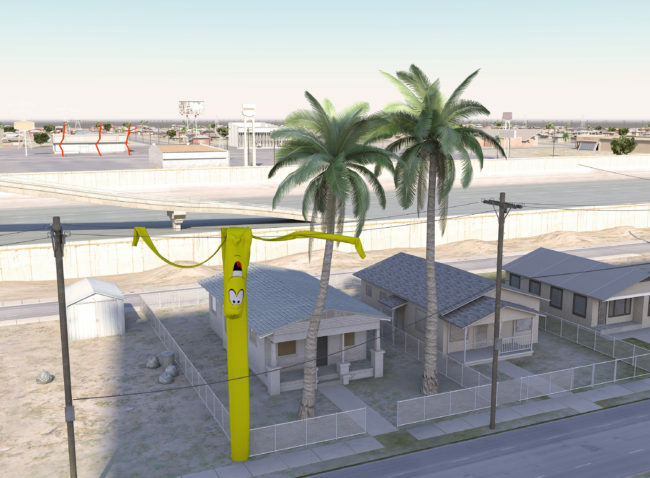 Portlock’s focus on the stagnant physical residue of de-industrialization is intended to call attention to its presence. The statement frames these works as investigative and research based, but these works are completely invented; they are not neutral documents that merely point outward. 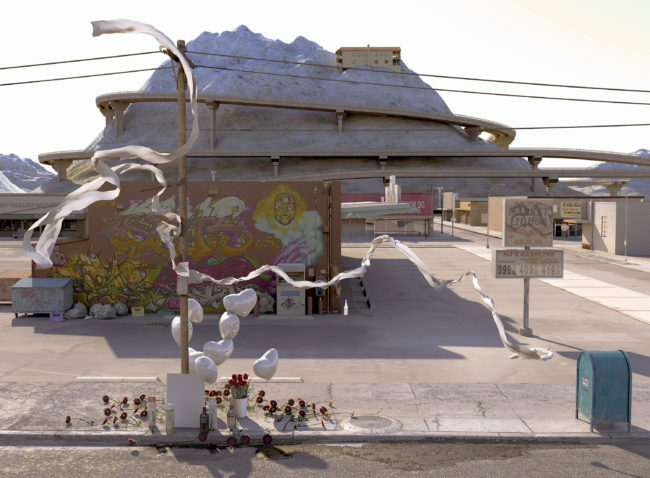 Portlock’s works carry a tone of solidarity, decrying the social and economic adversity underlying the urban decay we see, but simultaneously are emotionally distant and incredibly theatrical. This empathetic distance, allows these spectacular visions of our obsolescence and their blockbuster scope to be highly entertaining and pleasurable, undermining that solidarity. The work virtually models a ruin photographer’s paradise, augmenting the magnitude of desolation at every turn. An indulgence in the thrilling spectacle of despair of, Ash and Gold, conflicts with the values in its content that emphasize loss and hardship. In between cynicism, sympathy and disaster entertainment, the effect, of these images becomes precariously unclear. In Portlock’s ghost towns of Philadelphia and San Bernardino, we see the remnants of civilization cower beneath the immensity of a rapturous sky. Our destruction is laid out in front of us in a narrative invoking romanticism. Oddly, the sense of boundlessness essential to the sublime is evident here in digitally generated virtual space. Though this capability is not used in excess, there are subtle moments that suggest a possibility of infinite compression, and many that prompt investigation into the texture of the medium. Perspectival and proportional breaks with naturalistic space and lighting are playfully curious, either heightening the drama or interrupting it. Usually these interruptions become their own entry points, pulling one across planes of digital noise into absorptive openings occurring at the edges of pictorial architecture. Sweeping bands of gradated color and tone walk us back into the rich color of twilight, turning billboards into silhouetted pylons in Night, and telephone lines to a descending procession of vertical figures slumping below the horizon in Sundown. 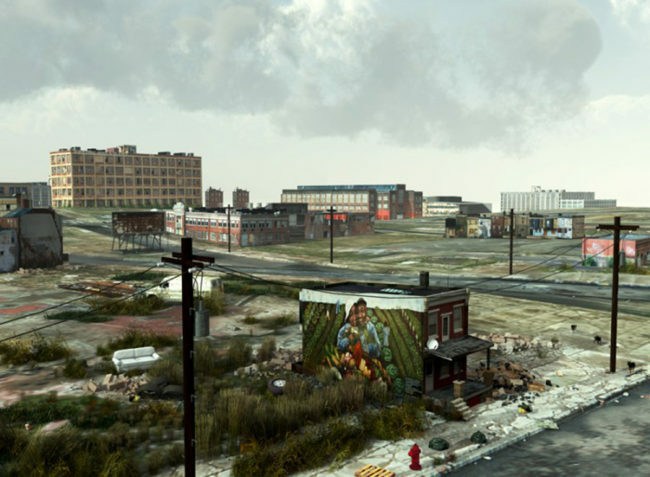 Strewn out upon a post- human world are the relics of economic adversity, cheap unhealthy foods, geographic isolation, crime, and social decay. Packs of roaming dogs become the colonists of this future world of yogurt containers, graffiti, and shopping carts. Reams of undulating cloth, gesturing into the sky in The Best of Times and out across an urban shrine in Memorial, evocatively act as specters of life within these static worlds. At times, a dormant cynicism felt throughout Ash and Gold emerges, and coalesces into misanthropy. 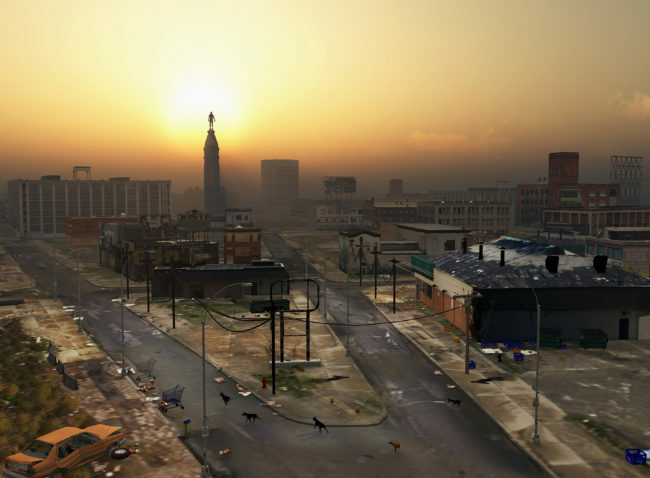 In two works titled Sundown and Salon we see the central tower of Philadelphia’s city hall, resolutely standing amid a deteriorated urban geography. The silhouetted figure that crowns it is not William Penn, but a generic male body. This proud edifice, in the same way that one-legged air dancers become contemptible vestiges of an ethics of profit over people in Yellow Dancer, is a vague and mocking indictment of man. Without any visible protagonists, one may interpret the work to call the viewer to play that anonymous role, but the tone of the work is not a call to arms. 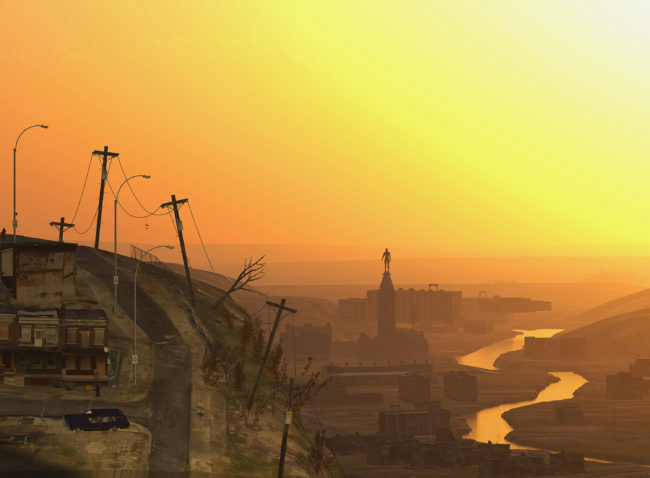 Our point of view is of impotent surveillance, beyond the possibility of redemption found in post-apocalyptic adventures like Mad Max and the Fallout video game series. In Ash and Gold, we only see contrasts of property decay and advertising, emphasizing both the vacant exuberance of the emblems of sale, and the decrepitude of what used to serve as home and employment. At times these pairings, along with the optimism of aged urban murals and the arresting refulgence of skylight, can become melodramatic in a way that seems to make generic what are current realities. The effect of these signifiers of turmoil and want, in hyperreal form and taken to a spectacular extreme, seem mostly to imbue these structures with a nebulous depth, or significance, not to make the reality of urban decay more objectionable, but its aesthetics more savory. Even though these landscapes are artificial, they use photographic material to dress the facades of buildings and background. In Portlock’s works Philadelphia’s industrial skeletons are taken into a hermetically sealed and expansive world of 1’s and 0’s. Structures we see today are copied and pasted all around, dislocating our understanding of place. We see our modern ruins performing in the play of the apocalypse, producing a fascination similar to seeing a friend act like a zombie. When we leave this exhibition, the eschatological plot in which our local surroundings played a role in photographic document remains, and becomes a lens through which to see these decayed structures in the flesh. Now these local and contemporary ruins become evidence, and omens, presaging our eventual demise. Without a strong statement of how these images are used to combat the potential reality that the work disapproves of, the question of its effect is vital. We accept this representation of our perhaps-inevitable end as we enjoy and investigate these works, like accepting ugly wallpaper in a room crowded with interesting faces and compelling personalities. The work invites us to gain intellectual satisfaction by obscuring critique with cynicism, and permission, through its emotional distance, to enjoy our catastrophic and sensationalized failure.In Ash and Gold, a troubling ambiguity remains: do these representations of doom and loss serve a cathartic role, purging fears of societal disintegration, or do they subliminally ingrain an ideology of defeat, further solidifying a collective history of self-destruction? Steve Basel is an artist living in Philadelphia.